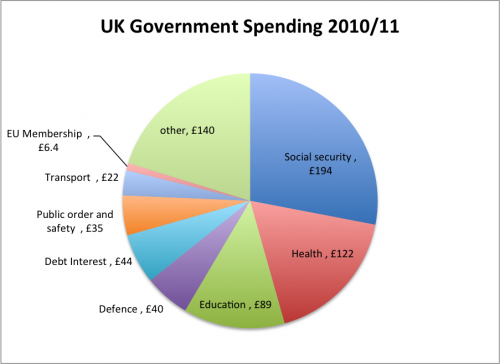 Home > Economics help blog > economics > How Should the NHS Be Funded? 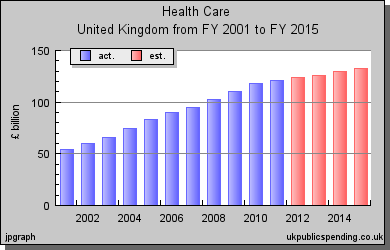 A report by the Institute of Fiscal Studies suggests the NHS will need an extra £20 billion of funding by 2020. The NHS already accounts for 23% of government funding, and is one of the few departments to be protected from budget cuts. But, in the age of austerity, spending commitments imply flat real spending increases for the next 5 years at around £110m. An Ageing population. Older people tend to need more health care treatment. Around 50% of health care costs are in the last year of a person’s life. An ageing population places a greater burden on NHS treatment. Increased availability of expensive medicines. Increased number of ‘lifestyle’ health problems, such as obesity related heart disease. How To Meet this Growing cost? Ironically, I’m writing this from an NHS bed in the Bradford Royal Infirmary. All I can say, is that I really hope there are no more possible efficiency savings from the cheese sandwiches handed out in A&E. My experience of the BRI is a hospital working at full capacity, with not a hospital bed on inch of floor wasted. On a more serious note, it’s all very well to talk of efficiency savings, but even the most optimistic would doubt that cost-cutting alone can meet increased demand without compromising quality of care. The principle of health care free at the point of use is deeply embedded. It is a brave politician who would change this current set up. However, prescription charges have been with us since 1952. We pay subsidised charges for dental treatment. Charging NHS patients is an effective way to raise money, but it challenges the long-standing principle of free at the point of use. It may be difficult to decide which services should be charged for. Plus there is the issue of providing means-tested charges and ensuring no one is squeezed out of provision because they can’t afford it. To raise an extra £20bn could require a significant rise in income tax. To give an example 1p on the basic rate of income tax is worth around £2billion. To raise an extra £20bn for health care would impose a significant extra tax burden. This kind of tax rise, could have detrimental effects on work incentives and living standards. To some extent, the amount of taxation which needs to be raised, depends on the rate of economic growth. The IFS have calculated that, assuming economic growth of 2.4%, the rising cost of health care could still require a tax increase of VAT going up from 20% yo 22% Since the credit crunch of 2008, the average growth rate has plummeted below the long run trend rate. Lower economic growth increases the need for tax rates to go up even more than this prediction. Another alternative is to reduce other forms of government spending. 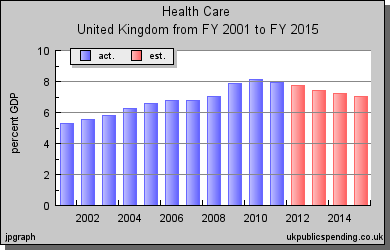 The NHS is currently the second biggest department, behind social security. The government have suggested an intention to try and scale back welfare payments by increasing the difficulty of getting disability benefits, unemployment benefits and sickness benefits. However, despite government plans, cutting welfare spending often proves much more difficult (and controversial) when put into practise. Given that the rising costs of the NHS are related to an ageing population, increasing the pension age, is one possible solution.